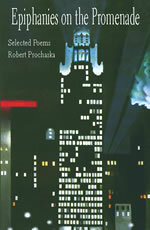 This first, full-length collection of selected poems by New York poet Robert Prochaska is a fascinating tableau of works that transports the reader from the poet’s boyhood to life in New York City, In the process, he provides spiritual links between his generation and past generations that few poets have traversed. Whether describing a dead man walking into a Horn and Hardart automat, or depicting his father boldly strutting down Broadway in the 1940s, Prochaska presents a treasure trove of characters, places, natural wonders, historical references, and epiphanies that bum an indelible mark on the reader’s consciousness via the poet’s prescient imagination. But beyond Prochaska’s power to shape mythic allusions to iconic events, his poems also offer a unique assessment of modern lives struggling with the dying past, creating riveting poetry out of visceral worlds that have long since disappeared. Many of these poems find their mark through sheer audacity, searching for new orchestrations of words that freely merge metaphor with motion, jolting the reader with images that awaken and disturb. Yet there are also disarming moments wherein the poet feels the true meaning of mortality and loss. If virtuosity of language and the power to transform is a hallmark of the best modern poetry, Epiphanies on the Promenade stands out among the best by an American poet. Solid and successful American free verse. Prochaska alternates between spare and orgiastic language to significant effect. As I read Epiphanies on the Promenade I learned I had a deep affinity with the book’s subject matter. Like the speaker, I spent “Half my life in the country, half in the city.” (“Prayer for Tonight”) We share a sense of wonder when we look back in time and see the winding path our lives have taken from the rural Midwest to bustling New York City. To escape his stifling environment, if only temporarily, he hops “the next freight in my dream.” (“Quest”). This is a classic urge shared by every country boy living within bicycling distance of train tracks. and spin the web I will become. I am goose-eyed and take wrong turns. here in a desolate place of my own choosing. The knife is the city, and I its hand. the palm of your hand feeling for the grit. for the things you and I wanted are similar. in a mud puddle along the Mississippi. These feelings come naturally with age, but I can attest from my own experience that a conflicted longing for a simpler time and place enters into the emotions of us displaced small- town folk. Something of this sentiment is contained in the memorable William Faulkner quote: “The past is not dead. In fact, it’s not even past.” I’m sure Prochaska had this phrase in mind when crafting these excellent poems.